London’s Cinema Museum, whose good news about the renewal of its release was reported here recently, is having an open weekend. 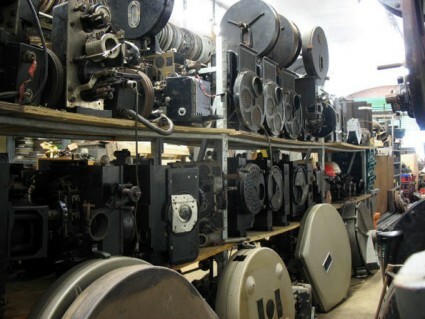 The Cinema Museum is a private institution, supported by its stills business, and it is not normally open to the general public, so this is a marvellous opportunity to discover one of London’s hidden gems, certainly if you have any interest in motion picture history. The collection represents cinema’s rich history from the earliest days to the present, containing every sort of item relating to film production, film exhibition and the experience of cinemagoing. The weekend will also feature an exhibition of new artwork by Cnidoblasts and Anna Odrich, reconfiguring artefacts from the collection and exploring the mechanics and gestures of silent comedy through sculpture. More information will appear on the Cinema Museum website in due course. And just to whet your appetite, there’s this delightful tour of the place hosted by the Museum’s founder Ronald Grant. We’ve featured it on The Bioscope before, but in the very early days of this blog, and it more than merits being screened again. I’m afraid that I won’t be able to attend the event in June, but I would urge anyone else from the ‘film history community’ — or anyone, really, with an interest in film, who is around London at that time — to go. Ronald has collected an amazing amount of material related to films and, more significantly, filmgoing. The Cinema Museum deserves national — and indeed international — support. To me it is incredible that this institution, with its rich and diverse collections, should be struggling for funding. They seem to be secure in their current location for the next three years, but they should be made secure permanently! Surely there must be some foundation or enlightened donor out there who would support them? Best wishes to Ronald and Martin and all the staff at the museum. My husband and I will be there with bells on! Thanks for the heads up – we wouldn’t have heard about it otherwise. I don’t mean to sound in any way churlish, but I genuinely don’t understand the point of a museum that is “not normally open to the general public”. If it is merely an archival collection of material relating to film and cinematographic exhibition, would it not make more sense for it to reside with the BFI or another publicly-funded national cutural institution (the National Museum of Photography, Film and Television, for instance)? No. These items are arranged in a way that they can be enjoyed and loved. While the Museum doesn’t have regular opening hours, you are able to view it, by appointment, if you ask nicely. The plus of this is that you get a personally guided tour and a great backstory as to the acquisition of the items in which you are interested. Having been to the BFI Archive, I can tell you that no such experience exists there. The Cinema Museum is privately-owned, and it is entirely up to them whether and when they choose to open it. And it’s determined by money – they exist on a shoestring and couldn’t manage visitors in a regular sort of way (the higgledy-piggledy layout doesn’t lend itself to that either). Whether the collection ought eventually to come into the care of a national institution is another matter. It is certainly of national significance. Good luck to them. My modest proposal would be for them to investigate attaining charitable status. The Cinema Museum is a charity. You can find their details on the Charity Commission website, http://www.charity-commission.gov.uk, registered charity no. 293285. I really wish I could go! I love the Cinema Museum. I would be there if I didn’t live in New Orleans now. I volunteered there for a while before I moved… it is the most interesting collection and they are the loveliest people. Best of luck to them.